Carrying on with the relief work the public sector domestic airlines, Indian Airlines today evacuated over 950 persons from the Tsunami-hit Port Blair region by operating eight flights from Chennai and Kolkata. In view of the large number of people still stranded in Port Blair, the airlines is planning to operate as many as 15 flights to island tomorrow. UPA Chairperson Sonia Gandhi listens to the woes of an injured tribal woman at Carnic, on Monday. The Centre stepped up relief operations today by arranging air-lifting of relief supplies for tsunami-affected areas and operated special flights to evacuate people stranded in Andaman and Nicobar islands. A senior official of the Central Government has been deputed in Car Nicobar, one of the worst-affected places, to coordinate massive relief and rescue operations there. Radhika (8), a survivor of Sunday’s tsunami is helped by her mother to wear a blouse at a hospital in Cuddalore, 180 km south of Chennai on Tuesday. To provide urgent relief to the Tsunami-affected people in different parts of the country, former Prime Minister Atal Bihari Vajpayee today announced setting up of a BJP Calamity Relief Fund and appealed to contribute liberally for the rehabilitation of the victims. The Indian Meteorological Department (IMD) today claimed an improvement in the situation despite the continuation of the aftershocks from Sunday’s earthquake near Indonesia that triggered the killer tsunami waves in the Indian Ocean. IMD officials said that though the aftershocks are continuing they are waning in intensity. It will take a long time for the people of the picturesque coastline here to overcome the shock of the nightmare caused by the killer waves that claimed over 100 lives in the densely populated fishing hamlets of the district. The death toll in yesterday’s hooch tragedy at Vikhroli here has risen to 51 with more persons dying in hospital, the police said late this evening. According to the police 119 more persons were admitted to the Sion, Rajawadi and Nair hospitals in a serious condition. The Congress is seeing a window of opportunity in Bihar as it has emitted a firm signal to the Rashtriya Janata Dal for the coming Assembly elections in the state that it is keeping all options open, including going it alone in electoral fray. The NDA today received a jolt ahead of the February Assembly elections in Bihar and Jharkhand when four of its MLAs and a former MP joined Laloo Prasad’s RJD. The Centre of Indian Trade Unions (Citu) today condemned amendment in the Indian Patents Act through an Ordinance saying it would lead to Indians paying heavily for everything, especially medicines and pesticides. Forest dwellers, including tribals, will soon have the legal right to minor produce from forests. Besides this, the Centre is also considering granting clearance to states to carry out public utility development works, including the construction of schools, dispensaries, water harvesting structures and laying electric and telecommunication lines, in tribal areas. Representatives of Kashmiri Pandit, at an international conference, have cautioned against any settlement with, “Pakistan involving dilution of Indian sovereignty in Jammu and Kashmir”. This, they claimed, could lead to a second partition. The National Commission for Women and its state panels today demanded that the Finance Ministry institutionalise, including women bodies, in pre-budget consultations, as is done with other interest groups. With the wildlife in state’s national parks left vulnerable to poachers and free loggers for almost a month now, the forest authorities at Rajaji National Park have taken stringent measures to check poaching. After amending the Patent law to meet the December 31 deadline of WTO, the government has proposed to come out with a separate legislation for data protection. The Supreme Court has cautioned courts against taking into consideration facts, recorded by the police, in supervision notes, while hearing a criminal case. Doctors from across the country today vehemently opposed the Centre’s proposal to replace hanging by the neck in case of death penalty with lethal injection saying it was against the Hypocratic oath for a medico to take life. The National Commission for Scheduled Castes and the National Commission for Scheduled Tribes yesterday demanded that reservation for Scheduled Castes and Scheduled Tribes be extended to all autonomous bodies in the government as well as the armed forces. Junior Kanchi seer Vijayendra Saraswati was interrogated for the second day today by the special team, probing the Sankararaman murder case and the Radhakrishnan assault case, in which Kanchi seer Jayendra Saraswati has been arrested. The USA has condoled the death of former Prime Minister P.V. Narasimha Rao, describing him as the initiator of economic reforms in India and the leader who inaugurated a new era of closer relations between Washington and New Delhi. Robbers killed two security guards at a mobile godown here and decamped with cellphones worth about Rs 50 Lakh on the intervening night of December 26 and 27. The robbers drugged two guards, Shrey Bahadur and Urvi Dutt Sharma, in liquor and strangled them before the robbery, the police said. A man who drives his bike handsfree. Another film revolving around teenage love. Carrying on with the relief work the public sector domestic airlines, Indian Airlines today evacuated over 950 persons from the Tsunami-hit Port Blair region by operating eight flights from Chennai and Kolkata. In view of the large number of people still stranded in Port Blair, the airlines is planning to operate as many as 15 flights to island tomorrow. The private sector domestic airline Jet Airways has also planned to operate six flights tomorrow to help evacuate people who are stranded at the island. However, a press note issued by Indian Airlines here said it plans to operate seven flights from Chennai and eight flights from Kolkata to evacuate people from the island. It is hoping to evacuate as many as 1,735 people tomorrow itself. It also informed that as a consequence of the operating the relief flights a number of scheduled flights of Alliance Air were being cancelled. The airline has planned to carry out the relief work by operating special flights for as long as it would be required by the government. It has so far in the past three days of operating relief flights evacuated over 1,790 people. Indian Airlines and Jet Airways are now being able to operate relief flights to the island as a result of repair work that was carried out on the airstrip the day after the Tsunami-hit Port Blair. Incidentally, Indian Airlines has despatched its General Manager (Commercial) of the eastern region to Port Blair to oversee the relief operations. He is leading a support team and is in constant touch with the monitoring team at the headquarters here. The Centre stepped up relief operations today by arranging air-lifting of relief supplies for tsunami-affected areas and operated special flights to evacuate people stranded in Andaman and Nicobar islands. A senior official of the Central Government has been deputed in Car Nicobar, one of the worst-affected places, to coordinate massive relief and rescue operations there. Relief supplies from Kerala, Orissa and Gujarat were lifted to Car Nicobar and Maldives yesterday, he said. Further relief material from Maharashtra, Karnataka, Orissa, Gujarat and Delhi for Car Nicobar was collected today, it said. Punjab, Uttar Pradesh and Madhya Pradesh have also offered assistance and logistics are being worked out, he said. It said the death toll had crossed 4300 and was likely to go up further once the bodies were retrieved from Nicobar islands and Tamil Nadu in particular. Several flights to Port Blair from Chennai and Kolkata have been operating to evacuate the stranded people, it said. Two AN-32 aircraft and one IL-76 plane with full load of relief material were sent to the Andaman and Nicobar Islands yesterday from Bhubaneswar, Bhuj and Ahmedabad. Medical teams with emergency stores have also been despatched to the islands. Two Coast Guard ships with relief material and medical team left for Campbell Bay yesterday while one naval ship and one Coast Guard ship left for Hut Bay, it said. Two Dornier aircraft dropped food and water at Hut Bay and Campbell Bay, it said. In Andhra Pradesh about 300 villages have been seriously affected and medical teams have been despatched to take sanitation measures there. Four Coast Guard ships have been deployed off Kakinada, Nellore and Krishna Godavari basin for search and rescue operations, he said, adding that four naval ships have been operating off the Tamil Nadu and Andhra coast. Around 500 villages have been affected in Tamil Nadu and medical teams have been deputed, he said. The Coast Guard has deployed two Chetak helicopters at Chennai. At least 25 villages have been affected in Pondicherry and people living in low-lying areas were evacuated to safer places and essential commodities provided. Police and fire services have been pressed into service and medical assistance has been provided. One IL-76 plane carrying relief material is being airlifted from Mumbai for Pondicherry. India has moved six MI-17 helicopters to Colombo to help the Sri Lankan authorities in search and rescue operations. For Maldives, 5.5 metric tonnes of food packets were arranged yesterday and 2.5 metric tonnes of good is being despatched today, it added. Meanwhile, the Ministry of Railways has contributed Rs 30 lakh to the Prime Minister’s National Relief Fund from the Railway Minister’s Welfare and Relief Fund to supplement the relief and rehabilitations. General managers of Southern and South Central Railways have been directed to coordinate relief efforts with the respective state governments and crisis management teams. “Lakhs of people have been affected by this devastating natural calamity in different parts of the country. They need urgent relief. The BJP has set up an ‘Aapda Rahat Kosh’ and we appeal to all countrymen to contribute to it with an open mind”, Mr Vajpayee told newspersons after an emergency meeting of senior party leaders to discuss the situation. Later, party General Secretary and spokesperson Sushma Swaraj said a committee headed by senior leader Jaswant Singh with party treasurer Ved Prakash Goyal as convener would oversee the distribution of money and material to people in different parts of the country as per requirements specified by the local units after assessing the situation. “Our objective is not only to provide temporary relief but also to rehabilitate the affected people. The party and BJP-ruled state governments would be adopting villages for their reconstruction”, she added. Ms Swaraj said the party would be setting up a central control room at its party headquarters under the supervision of its Vice-President Mukhtar Abbas Naqvi which would be the nodal point for the distribution of money and material. The party would carry out its relief and rehabilitation operation in coordination with the Sangh Parivar organisations at the local level and would “supplement” the government’s efforts in this direction. All BJP MPs and MLAs, would be contributing their one month’s salary to the relief fund as per the directions of party President L.K. Advani, Ms Swaraj said, adding that the party would be applying for Income Tax exemption. Former party President M Venkaiah Naidu, Mr Naqvi, Mr Shivraj Singh Chauhan, Mr S.S. Ahluwalia, Mr V.K. Malhotra and Ms Swaraj are among the other members of the committee. She said Mr Advani, who along with Mr Naidu was touring the Tsunami-affected areas in south India, would return to Delhi tomorrow after visiting the affected areas in Andhra Pradesh. Senior party leader Jaswant Singh would also be visiting Andaman and Nicobar Islands, including the worst-affected Car Nicobar. He would be carrying along relief material. The committee would also discuss the assessment of the leaders on their return, she said. The 90-minute-long meeting, presided over by Mr Vajpayee, was attended among others by Mr Jaswant Singh, Mr Malhotra, Mr Naqvi, Ahluwalia, Ms Swaraj, Mr Chauhan besides Delhi BJP President Harsh Vardhan and General Secretary Pawan Sharma. Chief Minister Mulayam Singh Yadav has provided an assistance of Rs 2.50 crore for relief and rescue work to the tsunami-affected states on behalf of the people of Uttar Pradesh. According to an official announcement, the Chief Minister has provided Rs 1 crore for Tamil Nadu, and Rs 50 lakh each for Andhra Pradesh, Kerala and Andaman Nicobar. This amount will be released with immediate effect to facilitate relief work. Admitting that the amount being sent was insufficient, the Chief Minister said it represented the collective will of the people of the state. He said in their hour of grief those hit by the calamity should not think that they were alone. Mr Yadav said the natural calamity had caused huge loss of life and property and the respective governments of the affected states would be unable to repair the loss. He urged the people of the entire country and specially the voluntary organisations to come forward to help the affected people. He expressed the hope that the people of the state and voluntary organisations would make efforts to provide relief to the affected people. State BJP president Kesarinath Tripathi announced the setting up of a relief cell at the BJP headquarters and urged the party MPs and MLAs to contribute generously. Similarly, UPCC chief Salman Khurshid has asked party workers to collect money to help the victims in their hour of need. Sahara India Parivar has also set up a relief fund with their initial contribution of Rs 21 lakh. Air-India will transport relief material, donated by various agencies and NGOs, to the tsunami victims in India free of cost from its destinations on the global network. Agencies wishing to donate relief material can contact Air India’s offices in their cities. An Air-India spokesman said transportation of relief material would be given top priority. Chief Minister N.D. Tiwari has announced a donation of Rs 1 crore to the Prime Minister’s Relief Fund for distribution as relief in the tsunami-affected areas. Governor of Uttaranchal Sudershan Agarwal today announced a personal donation of Rs 1 lakh for the victims. The DMK today donated Rs 1 crore to the Prime Minister’s Relief Fund for the tsunami-affected areas of the country. In a letter to AICC President Sonia Gandhi, DMK President M. Karunanidhi said he had instructed his party MPs and MLAs to donate a month’s salary towards the calamity relief fund. Tamil Nadu Chief Minister Jayalalithaa today announced an ‘immediate relief package’ of Rs 153.37 crore for the people affected by the December 26 tsunami, which hit several coastal areas of the state. 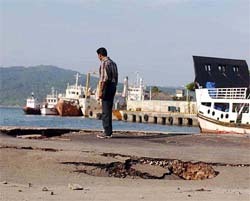 The Indian Meteorological Department (IMD) today claimed an improvement in the situation despite the continuation of the aftershocks from Sunday’s earthquake near Indonesia that triggered the killer tsunami waves in the Indian Ocean. IMD officials said that though the aftershocks are continuing they are waning in intensity. Listing the cause of the quake, it was pointed out that the quake occurred at a point where plate boundaries meet, the rupture that resulted caused a major displacement on the ocean surface that unleashed the killer tidal waves. Such quakes, the IMD said occur once in 40 to 50 years in these areas. It was also mentioned that the tremors measuring a little over 5 on the Richter Scale have been recorded in areas within 1,000-km radius of the epicentre of the quake off the Indonesian Island of Sumatra. The IMD has recorded over 30 aftershocks till now. Ruling out the occurrence of a similar tsunami in the Arabian Sea, the IMD officials said there was little chance of such tragedy striking the Arabian Sea coastline because it was not vulnerable in the way the Indian Ocean belt is. External Affairs Minister K. Natwar Singh will be arriving here early tomorrow cutting short his six-day visit to the Gulf in view of the tsunami disaster, the Ministry of External Affairs announced today. Mr Natwar Singh would be returning from Dubai. The Minister, who was to undertake a bilateral visit to Bahrain after meeting leaders in Oman and UAE, spoke to his Sri Lankan counterpart Lakshman Kadirgamar and offered condolences and all assistance to Sri Lanka, the worst hit country by the undersea quake disaster. A British couple will go ahead with plans to get married in Phuket, unfazed by the trail of destruction unleashed by killer tidal waves that hit the popular Thai island, a hotelier said today. Motoring consultant Marc Singleton,(43) and his fiancee Lucinda Semark, (35) flew to Phuket from Singapore yesterday for their wedding tomorrow at Cape Panwa Hotel on the southeastern tip of the island which was relatively unscathed by the tidal waves. “It’s going ahead as planned. They will enjoy a Thai style wedding in the morning with monks, then go to Phang Nga bay on a speedboat, sail on a traditional Chinese junk, and come back for cocktails and fireworks here at the hotel,” a guest relations manager said. In a string of sea-facing village in Karunagapllay taluk, there could hardly be anyone who is not bereaved. “It all happened in a flash. Before one could come to know what it actually is, furious waves had taken away all we have ...our kith and kin, small savings, thatched huts and fishing implements. We don’t know where to go and how to start it again,” said Francis from Azhikkal. What awaited 39-year-old Sajeevan when he returned from fishing on Sunday was the shocking news that his wife and daughter had been swallowed by surging waves. A long strip of huts near Vallikkavu had remained cut off for several hours before the rescuers came in boats to take out bodies and move the survivors to safer places. Frightened by surging waters, many people had shut themselves up in their houses, which exposed them to greater danger than those who sought to escape the surging waters by running away, local people said. The true dimensions of the tragedy would be known only when all these houses are opened, the rescuers said. The immediate problem staring the survivors is the conduct of the funeral of their relatives who died in the tragedy. Many of those staying in the relief camps were not in a position to receive the identified bodies, as they had no place to take them for a decent burial. Karunagappaly panchayt is making arrangements for mass burial as the only way out in the situation. The killer wave tsunami began to hit the area around 10.30 am yesterday. The first report of the calamity came in from Thangassery near Kollam town, but soon it became evident that villages along the Karunagapally coast were going to be the worst hit. As the narrow brittle roads linking hamlets with nearby towns got washed away, rescuers had to walk up to reach the danger zones. The hospitals around were also caught unawares as injured kept on pouring in the afternoon. In many places, the doctors and paramedics on Christmas holidays had been summoned urgently. About 30,000 people have been shifted to relief camps as entire coastal villages are eaten away by the tidal waves. Sharing the grief of their brethren, people from all communities and walks of life are pouring in to lend a helping hand to the rescue work. A Naval team is overseeing the operations. The death toll in yesterday’s hooch tragedy at Vikhroli here has risen to 51 with more persons dying in hospital, the police said late this evening. According to the police 119 more persons were admitted to the Sion, Rajawadi and Nair hospitals in a serious condition. Most of the deaths were reported from the Rajawadi Hospital, close to the Indira Nagar slum where the victims lived. The police said 38 persons died at the Rajawadi Hospital while eight more were brought dead. The police said the toll was increasing as more and more people are reporting to the hospitals. Many of them had taken home ‘Moonshine’ in bottles from the vendor and had consumed it at home. According to the analysis of samples recovered from the vendor, the spurious liquor was laced with methyl alcohol apparently to increase the ‘kick’. The brew was priced at just Rs 16 per bottle. The Maharashtra Government today suspended 22 senior police officials in whose jurisdiction the twin tragedies took place. Maharashtra’s Deputy Chief Minister R.R. Patil followed tough talk with action that resulted in raids at various places in and around the city. “While it is true that we would not like to disturb the UPA at the Centre but at the same time we have to keep party’s interests also”, a senior Congress leader told The Tribune here. “If RJD supremo Laloo Prasad Yadav is not willing to give us a respectable number of seats, then we have other option open to us”, he said, adding “we can also align with the Ram Vilas Paswan’s Lok Jan Shakti Party or go it alone in Bihar Assembly polls to be held from February 3”. Though Congress President Sonia Gandhi has formed a three-member committee headed by Human Resource Development Minister Arjun Singh to hold talks with Mr Yadav on seat-sharing, senior leaders of the party have told her that it would be in the interest of the party to weigh the pros and cons of all options before taking a final decision on the issue of alliance. The entire issue has to be handled in such a manner that one treads softly on the RJD supremo’s toes and makes party clear to him that the political cooperation was a one way street, an AICC member said admitting that RJD’s 22 Lok Sabha MPs were crucial for the survival of the UPA government. The prospects of the Congress in Bihar have improved much since the last Assembly elections when the Congress occupied Opposition benches in Parliament. Bihar PCC President Ram Jatan Sinha has reported to Mrs Gandhi that there is much enthusiasm and confidence among the party workers ever since the Congress-led UPA government assumed power at the Centre. Under the circumstances, the Congress may opt for a course that would ensure that the strength of the party in Bihar Assembly is increased substantially. It has reportedly demanded 100 out of the total 340 seats from the RJD leader, who has made it known to the Congress high command that he was not going to concede more than 25 seats. The Congress claim for a big share in the seat-sharing arrangement is strengthened by the party’s victory in Assembly elections in Arunachal Pradesh and Maharashtra. There is a mixed opinion among the Congressmen in Bihar about the party continuing its alliance with the RJD. A large section is in support of the party going it alone, while others favour fighting the elections on an increased number of seats in alliance with the RJD. Still another opinion is for an alliance with the Lok Janshakti Party which some feel would be a better electoral prospect. In a changed situation and hard bargaining by the party, Mr Laloo Prasad may concede to the Congress demand for more seats than the 25 or 30 indicated by him earlier. But if he doesn’t, the Congress may opt for contesting the election independently, in keeping with the wishes of the larger section of the party men in Bihar. But in the event, the possibility of the RJD leader benefiting from a multi-cornered contest cannot be ruled out. BJP MLAs K.K. Mishra (Chanpatia) and Krishna Chandra Prasad Singh (Lakhisarai), JD(U) MLA from Bikramganj Akhlaq Ahmed and former Urban Development Minister of Jharkhand Bachcha Singh of JD(U) joined the RJD in the presence of party chief and Railway Minister Laloo Prasad. Citu president M.K. Pandhe said in a statement that the amendment was under pressure from powerful multinational corporations, with the World Trade Organisation (WTO) as their front, to corner markets and earn higher profits from scientific and technological inventions. “Citu condemns this amendment through Ordinance as this is a deliberate trickery to avoid discussion in Parliament which was in session till only two days back,” Dr Pandhe said. He said the amendment proves that the government had willingly weakened its own position vis-à-vis the powerful economies that control 99 per cent of all patents. “India is not at the same platform with them financially or technologically or in the matter of enforcement. This amendment removes all protections India has enjoyed so far,” he said. CITU said Indians would now have to pay heavily for everything, particularly medicines, pesticides and biotechnological products. “Peasants and patients are to be the worst-affected,” said Dr Pandhe. Union Minister of Environment and Forests A. Raja has said that the government was in the process of giving final touches to the draft model legislation of the State/Union Territory Forest Produce (Ownership of Forest Dependent Community) Act, 2005, which will give right to minor forest produce to forest dwellers. At a recently held meeting with the related consultative committee of Parliament, Mr Raja said to protect genuine tribals from being evicted, the Centre was also considering issuing instructions to the state governments, advising them not to evict them without conducting proper enquiries into claims of possession of forest land. Considering the fact that Scheduled Tribes account for around 8.8 per cent of the total population, the move is expected to benefit more than 67.76 million tribals, mostly spread across in forests and hilly regions of the country, besides other communities living in forests. To ensure environmental conservation along with economic growth of tribal communities, which were mostly dependent on forests, the ministry had issued guidelines in 2003 for providing one-time clearance under the Forest (Conservation) Act for public amenities projects such as underground drinking water supply pipelines, electric cables and telephone lines. Mr Raja said the state governments could give clearance to such proposals at their level. Moreover, to consolidate the development process in tribal areas, the Centre was also considering granting general clearance under the Forest (Conservation) Act to the states for carrying out public utility developmental works such as construction of schools, dispensaries, water harvesting structure and laying of electric and telecommunication lines, he added. The government, he said, was committed to convert all forest villages into revenue villages so that public utility projects could be extended to these villages. However, the matter was presently on hold due to a ban imposed by the Supreme Court in November, 2000. To facilitate the cultivation of tusser, the government has also permitted more than 20 host tree species to be grown in forest areas as per the guidelines issued in June, 2004. Mr Raja said the government was also considering the possibility of allowing lac cultivation in forest areas to promote tusser and lac cultivation to improve the livelihood of tribals. Members of the Parliamentary committee also emphasised the need for conferring rights to non-timber forest produce for tribals and other weaker sections working in the forests and safeguarding their rights over mineral and water resources in the forests. This, they said, would help protect livelihood rights of communities living in forests, in particular tribals, and also develop long-term stakes in the conservation of the forest resources. Expressing concern at the stay granted by the Supreme Court on guidelines giving legal recognition to traditional rights of tribals with respect to the forests within the state jurisdiction, they said that an awareness campaign should be launched to ensure wider participation of people in forestry issues. The airfield is buzzing with activity as it prepares to host the 5th edition of Aero India in February, 2005. Among the many expected attractions is a display, for the first time, of air-to-air refuelling with one of IAF’s newly acquired IL-78 refuellers, Lockheed Martin’s F-16, and the notorious Orion P3C, the maritime surveillance aircraft that the US wants to supply to Pakistan. Confirming these details, Yelahanka Air Officer Commanding, Air Commodore S.P. Singh, said that so far, 78 entities from 25 countries had confirmed their participation. More are expected, as are full details of participating aircraft. After a gap during the sanctions period, the US participation is back, and will include the US Army. Other foreign companies who have confirmed include Northrop, Tashkent, Bell and Gulf Stream. Hindustan Aeronautics Limited will feature 12 aircraft, including the LCA Tejas (of which four might fly if the second prototype vehicles also undertakes its first flight), the Dhruv ALH, and the intermediate jet trainer (IJT). The IAF will also fly the Jaguar, the Sukhoi-30 MKI, the Mirage, and the newly upgraded MiG-21 Bison. The French Mirage 2000-5 from Dassault Aviation will fly, as will the Russian MiG-29. IAF aerobatic teams Surya Kirans (Kirans) and Sarang (ALH Dhruv) will put on their waltzes in the air. As many as 12 Air Force chiefs of different countries have confirmed participation, including China (Gen Qiao Qingchen of the People’s Liberation Army — Air Force), Germany (Lt-Gen Klaus Stieglitz) and Japan (General V. Tsumagari). Though the LCA like Gripen of Sweden is yet to confirm participation, the Swedish air chief, Major-Gen Jan Andersson, Inspector, Swedish Air Force will be a guest. While fighters tend to hog the limelight at air shows, aviation enthusiasts will also look out for the transport and rotary wing aircraft, which are as much a joy to watch. The German Transval, Embraer’s Legacy and the Falcon 2000 or 900 have confirmed so far. The US Army is expected to bring a chopper. Apart from the runway extension of 350 feet to 7600 ft, finishing touches are being put to a new hangar, the fourth, which will add 4200 sq. mts of stall space. A new aircraft dispersal area to the north of the runway for flying display aircraft, larger static display area, a new public air-display viewing area, widening of National Highway 7 and State highway 09 leading to Yelahanka, and a new road bypassing Yelahanka, town are being readied. A resolution, passed at the conclusion of the two-day international conference of Kashmiri Pandits, said any settlement with Pakistan, which perpetuated their exile and did not consider their territorial claims, would be opposed by the community. “The international conference re-affirms the demand of the Hindus of Kashmir for a separate homeland constituted of the territory of Kashmir province organised into a centrally-administered territory and governed by the Constitution of India,” the resolution said. The establishment of a political affairs committee, comprising prominent Kashmiri Pandits to pursue the goal of a ‘separate homeland’ was also envisaged. The demand to declare the Kashmiri Pandits, who were forced to migrate from the valley in and after 1990, under the International Convention for Refugees till they are able to return to their homes in the valley, was also made at the conference. NCW member Nirmala Sitharaman, after a two-day round table meeting on Pre-Budget Consultation for 2005-06, told mediapersons that reforms needed to be included in the Budget for 2005-06 would be presented to Union Finance Minister P. Chidambaram as a memorandum of demands after an extensive review of all issues raised at the meeting. The Finance Minister, said Ms Sitharaman, had already agreed in principle to hold pre-budget consultations with women bodies. Ms Sitharaman said during the meeting, participants stressed on the need of constitution of task forces at the panchayat level to audit and reassess the 100 per cent coverage of habitations under the rural water supply scheme, as asserted by the latest economic survey of India. “Water is a major issue. 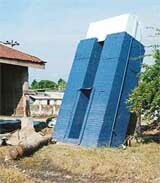 Its quality, both in rural as well as urban areas, needs to be tested periodically. Considering it being such a serious issue, there are too many ministries, authorities and boards dealing with it. It needs to be simplified for a unified approach,” she added. The participants, she said, also stressed on the need for refocusing on agriculture and called for subsidies in the sector to continue. “Any attempt in the Budget to discontinue with subsidies in agriculture will not be welcome,” she added. The commission, after consultations with state commissions and experts groups, identified key areas where action, change and thrust were needed. She said the main concern of women which could be addressed in the Budget included poverty, livelihood, health, nutrition, education, water and sanitation. There was a need to focus on gender awareness and mainstreaming in budgeting at all levels and to ensure effective use of resources to achieve gender equity, she added. Among the demands, the NCW proposes to place before the Finance Minister for his consideration, include achieving maternal mortality rate of two per thousands live births in the worst affected 300 districts and earmarking funds for women under the Rural Infrastructure Development Fund (RIDF) through SHGs in 100 drought prone districts for cultivation of medicinal herbs, flowers, vegetables and horticulture. Even as the forest guards continue to be on strike, the park authorities have sought the services of daily wagers to protect the animals and trees in the forest. The park employees on leave have been asked to report to duty immediately but in the meanwhile daily wagers who are usually pressed into service in February have been hired, said park Director G.S. Pandey. The ongoing strike of nearly 2,500 forest guards is well into its fourth week, leaving the park vulnerable to poachers. Rajaji National Park houses hundreds of wild tuskers apart from other animals. The forest guards have been on strike since the last week of November over three major demands, including fixation of category, promotions for all and their re designation from forest guards to forest beat officers. Even as two of the demands being made could be met, promotion for all is unlikely, official sources said. The minister said government would look into the need for data protection of all sectors before bringing in the legislation. Earlier, delivering his keynote address, he said the government sought to allay any fears of rise in prices of medicines and said such fears were unfounded. He said about 97 per cent of the drugs were off-patent and there were life-saving drugs besides Drug Price Control Order, adding the country had not brought in the law just for compliance. He said the domestic pharmaceutical industry exports were pegged at Rs 1,400 crore with a compounded annual growth rate of 30 per cent. The Supreme Court has cautioned courts against taking into consideration facts, recorded by the police, in supervision notes, while hearing a criminal case. A Bench comprising Mr Justice Arijit Pasayat and Mr Justice S. H. Kapadia said if any reference was made to the supervision notes recorded during investigation, they should not be taken note of by concerned courts. “The supervision notes can in no count be called. They are not a part of the papers which are supplied to the accused,” the court said. Neither the prosecution could utilise the supervision notes as a piece of material or evidence nor the accused could refer to it in his defence, the court said. Further taking serious note of the disclosure of facts in the confidential document, the Bench directed all states, Union Territories and DGPs to protect the confidentiality of supervision notes and take appropriate action against officers, who intentionally make the document available to any person. The strong opposition to the recommendation by the Law Commission came during the central council meet of the 69th annual conference of Indian Medical Association (IMA) underway here. “The Law Commission has observed that hanging by neck is brutal and should be replaced by the more sophisticated lethal injection. This is against the oath that doctors take before being inducted into the service — that they will strive only to save lives,” Dr Vinay Aggarwal, secretary general of IMA said. The recommendation had caused confusion in the medical fraternity with its ‘obvious contradiction’ of the basic nature of professional duties expected of doctors, he said. The National Commission for Scheduled Castes (NCSC) and the National Commission for Scheduled Tribes (NCST) yesterday demanded that reservation for Scheduled Castes and Scheduled Tribes be extended to all autonomous bodies in the government as well as the armed forces. Addressing mediapersons, NCSC Chairman Suraj Bhan welcomed the SCs, STs and Other Backward Classes (Reservation in Posts and Services) Bill, 2004, adding, however, that in the absence of a penal clause for non-implementation, the Bill had little utility. He suggested that the non-implementation of reservation in the government sector should be treated as an atrocity against the SCs and STs and those responsible punished with a minimum imprisonment of six months and fine. Referring to the reservation in the private sector, he said all corporate bodies, including those established with foreign collaboration, should employ SCs and STs. As a result of reservation, he said as many as 50 lakh persons, belonging to the SC and the ST, were employed in the government sector in the country. “An additional 20 lakh persons could be employed with the extension of reservation to the private sector,” he said. He said the percentage of reservation should be on the basis of population. Lamenting low representation of SCs and STs at senior levels, he said there was only one person belonging to the SC and one to ST among 70 secretaries. “Among 100 additional secretaries, there was no one belonging to the SC or the ST and among more than 100 joint secretaries, only three were from the SC and none from the ST.” On the issue of atrocities against SCs and STs, Mr Bhan said the commission took immediate action whenever such incidents were reported in newspapers. The junior acharya was questioned for about three hours at a bungalow near the office of the District Superintendent of Police. Later, talking to newspersons at the mutt, the junior seer said he had answered whatever questions the police team had posed to him. “The seer would not have committed any wrong for which he was arrested,’’ he had told the team. “We learned with sadness of the death on December 23 of Narasimha Rao, Prime Minister of India from 1991-96. Mr Rao was an important figure in the history of modern India, inaugurating major economic reforms that have stimulated growth and prosperity throughout the country,” Deputy Spokesman of the State Department J Adam Ereli said in a statement today. The robbers later decamped with 888 mobile phones worth at least Rs 50 Lakh and some hard discs out of the goods worth Rs 5 crore from the godown, the police said. Prima facie, it appears that the robbers were acquaintances of the guards deputed at the carrying and forwarding agency of Samsung Appliances on the Dehra Dun-Delhi highway.